Most motorcycle riders are conscientious road users, following traffic and safety laws as well as (and sometimes better than) drivers in passenger cars. However, many people continue to judge motorcyclists unfairly, seeing them as reckless, thrill-seeking, or irresponsible. Unfortunately, this negative impression of bikers can be costly for motorcyclists involved in an accident, reducing the amount of money they can receive for their injuries or barring them from receiving any damages at all. Police reports. Police officers may assume that the motorcyclist was negligent even if there is no evidence or witness testimony to support that conclusion. Medical records. Doctors know how dangerous motorcycle riding can be, and may be frustrated that bikers continue to ride despite the risks. This may cause a treating physician to speculate as to the cause of an accident in their notes, which will end up in the victim’s medical records. Insurance claims. Insurers are notorious for underpaying motorcycle injury claims, using biker bias to their advantage. An insurance company can place an unfair portion of fault on a motorcyclist or offer less in a settlement simply because the victim is less likely to be treated fairly in court. Defense attorney statements. 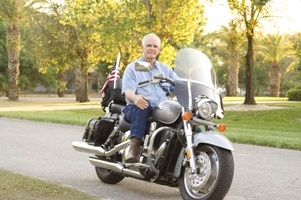 Attorneys are well aware of the public perception of motorcyclists, and will not hesitate to use it to their advantage. The driver’s attorney may advise his client to fight the claim—even if the driver has admitted fault—since juries are likely to be on the driver’s side. Judges and juries. Judges are supposed to remain impartial when hearing cases, but that doesn’t prevent some from denying compensation to those they perceive as reckless. Juries often pay lower awards to motorcyclist victims than to drivers and passengers in cars, even if they have similar injuries. Gathering evidence from the crash scene. A good attorney will gather evidence that can prove negligence even if a jury is mistrustful of riders. For example, it is more difficult to see a victim as “reckless” if he or she was wearing an approved motorcycle helmet and required safety gear. Providing detailed riding records. Motorcyclists who have taken rider improvement courses, purchased comprehensive insurance, or have never been in an accident before are more likely to be seen sympathetically by a jury. Challenging false statements. Your lawyer must not only provide proof of your skill as a rider, but question any false or misleading statements that obscure the facts. For example, a witness may have assumed that you were speeding simply because your engine was loud, and an attorney can challenge that testimony and request clarification. Selecting the right jury. Attorneys can ask potential jurors during the jury selection process how they feel about motorcycles or riders, forcing them to admit whether they can judge bikers fairly before the trial begins. If you have been injured in a motorcycle crash, our legal team will carefully examine the evidence and build a strong case to protect your rights. The injury attorneys at GriffithLaw are proud to provide initial consultations to victims free of charge, and we do not collect any legal fees until your case is resolved. Simply fill out the short contact form on this page or request a free copy of our book, The 10 Worst Mistakes You Can Make With Your Tennessee Injury Case.